Workplace safety and health for any industrial environment is highly critical for its own existence. Employers do comply with the prevailing legislation to ensure that the employees have adequate knowledge and get training to protect them from the workplace hazards and health risks. Apart from meeting the legal compliances, organisations can count on many benefits if they provide effective health and safety training to workers. Not through simple boring lectures and box ticking exercises, industries need to take special interest to educate and equip the workforce to effectively handle high risk and dangerous workplaces and instill them the importance of remaining healthy and safe while on duty. For employers, who have made their workplaces safe for workers, apart from meeting all legal formalities, can relax since their staff is now competent to take care of themselves and protect others too in adverse situations. Safe work environment leads to minimal work interruptions and more work hours as there will be less number of accidents, and chances of employees falling ill remains minimal. Workers too feel relaxed and happy to work in safe and secure places and their productivity obviously remains high. So, how to plan a safe and healthy workplace? Employers, apart from following all guidelines and stipulated safety laws, should also organize regular in-house safety training for their staff by competent safety and health personnel. Safety training varies from one workplace to another as HSE experts and trained safety professionals should assess the risk factors and formulate suitable in-house safety training program for everyone – from permanent and daily wagers to management representatives. Priority should be given to do risk assessment to know the exact training needs, methodology, potential risk areas and employees’ knowledge, skills and capability to undergo training on workplace safety. Companies should also seek employees and employees’ representatives’ cooperation for planning and organizing training camp inside the workplaces. After the training, there should be a regular review session by the people responsible for safety training to check how good the employees are following safety standards, conditions of safety equipment and existing machinery and whether there is any addition of new work or machinery and risk assessment need to be prepared. The review report along with recommendations should be shared to the management from time to time, which will lessen the chances of injuries due to accidents, near misses or health issues. 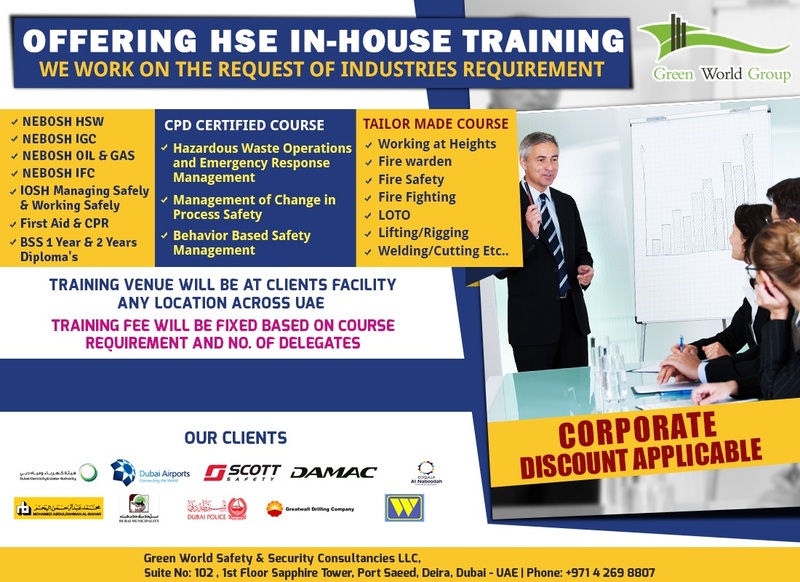 Companies planning for regular in-house training for their employees to prevent workplace catastrophe and shutdowns should engage professional safety and health training institutions such as Green World Group, which is an international organization having branches across the globe and engaged in imparting both classroom and in-house training for workers to handle various risks and dangers associated with workplaces. Alternatively, industries can sponsor their workers to join highly rated safety courses such as IOSH, NEBOSH and industry-specific health and safety diploma courses conducted by Green World Group and get them the internationally recognized certifications. These highly skilled HSE experts can be engaged to train workers on occupational safety and implement suitable safety standards to prevent accidents and losses.